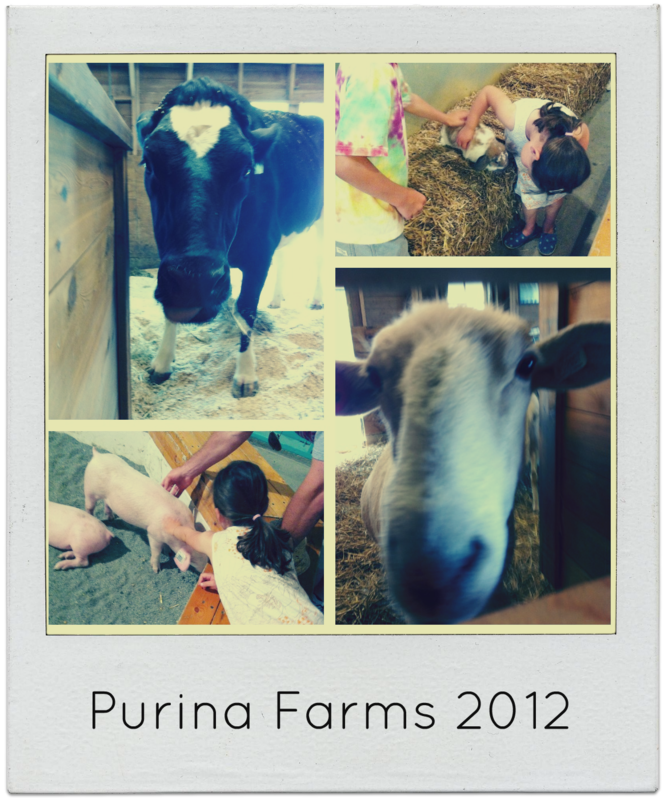 Over the weekend we went to Purina Farms. Yes, they have farm animals but the main attraction is the Dog Show. Vance had seen the dog show at a school assembly and he was excited to see them again. Together we were telling Vaughn about it and I mentioned there were animals there that you could pet. "But can we cuddle them? ", she asked. However, 30 minutes before leaving the house that morning, the wanna be animal cuddler started screaming that her ear hurts, which more than explained her whiny behavior for the days recently. I knew it was Swimmers Ear. She gets it easily and I always put drops in after being in the water but I guess they're not fool proof. Quickly, we left the house, took her to a Take Care clinic, stopped and got gas, drove to another pharmacy to pick up her meds, and still managed to make it to Purina Farms on time. A freaking record for an urgent care trip. Did you know that visiting Purina Farms is free? Parking is free too. The only thing that you have to do is call ahead and make a reservation. I liked this place because there's no stress involved. It's small, fun for the kids, and doesn't have to be an all day affair. The dog show was amazing! It was the highlight of the day. We rounded out the day with a little fishing, a little lounging, and rounds of Tylenol and ear drops for Vaughn. And because we like to live on the edge, we riskily took the kids out to dinner, knowing a Vaughnie-meltdown could happen at any moment. But all was well! Lettuce wraps were eaten and the chopstick drumming was kept at a minimum. What was the highlight of your weekend? Hope it was a good one! Hi Anne! I think I see a little bit of everyone in Vance - Must be a good mix!